Users often underestimate the significance of pop-up ads that appear on their browsers. You might think that constant notifications via Updatecomputerfast.net inform you about the latest Adobe software updates, and you can choose to ignore them, but that is not exactly the case. You will see the Updatecomputerfast.net pop-up on your screen when you have at least one adware program installed on your PC. This means that your system’s security has been compromised, and you must remove the program at once; otherwise you will not get rid of Updatecomputerfast.net. You have to take care of any potential threats that might be running on your PC at once. You might say that the Updatecomputerfast.net pop-up appeared on your screen when you opened a specific website, and it has nothing to do with the programs installed. That COULD be true. You could have opened an adware-related website that is part of online marketing networks, and thus the pop-up sprang into action. However, it is far more likely that the Updatecomputerfast.net domain is being used by a particular adware program that tries to promote third-party content. While there is no specific adware program associated with the Updatecomputerfast.net pop-up, you have to take all the potential risks into consideration and delete all unfamiliar apps. Adware programs present a variety of security risks, although they are not particularly dangerous by themselves. The problem is that they can always be exploited by cyber criminals to promote corrupted content or redirect users to unfamiliar and sometimes dangerous websites. What’s more, users are seldom aware that they install adware programs on their computers willingly. The same could be said about the program behind the Updatecomputerfast.net pop-up. Chances are you have installed it yourself while you were browsing some adware-related web page. It might have also arrived in a software bundle with some program you wanted to install. This only shows how important it is to go through each and every installation carefully. Please take your time to read all the installation steps, especially if you have downloaded the program from a third-party website. You might be presented with an offer to install additional applications, and if you breeze through the setup wizard, you may miss your chance to reject them. On top of that, even if you DO install adware on your PC, you can still avoid serious computer infections, as long as you do not click any of the Updatecomputerfast.net pop-ups. 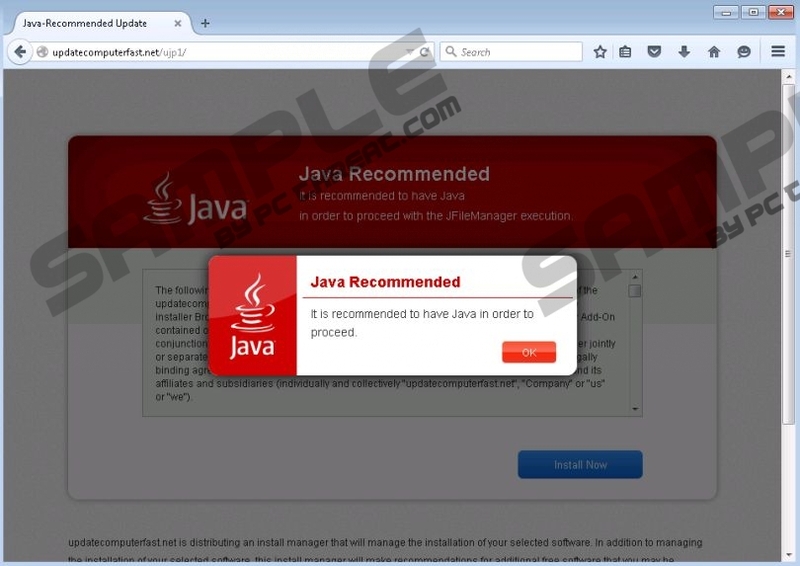 The notification on the pop-up might tell you that you need to install or upgrade your Java software, but you should download software installation packs from their official websites only. Clicking download and installation buttons on such pop-ups will only result in the installation of more adware on your PC. In the long run, you might suffer a severe computer infection. Therefore, the sooner you remove the program behind Updatecomputerfast.net, the better. To determine which unwanted application you need to remove from your system, please run a full PC scan with the SpyHunter free scanner. A list of potential threats will be generated for you at once. Usually, it is possible remove the unwanted programs via Control Panel, but, if you feel that this is too much of a task for you, you can always rely on SpyHunter to remove the unwanted programs for you automatically. Quick & tested solution for Updatecomputerfast.net removal.